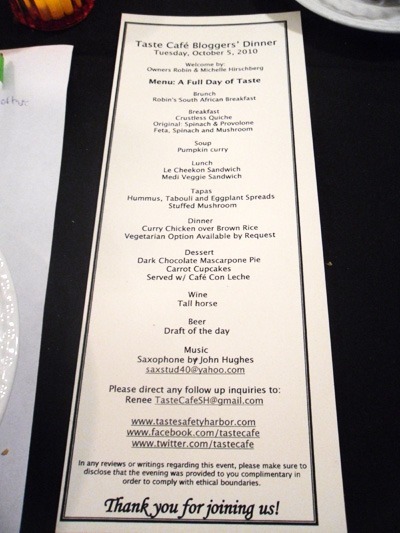 Taste Cafe hosted a bloggers dinner last week for local food critics and reviewers in the Tampa Bay area. The dinner was provided free of charge and was meant to be a tasting of various dishes on their menu. Breakfast, lunch, and dinner choices were served to us. In addition, the smooth saxophone sounds of John Hughes complemented a pleasant evening of tasting. Each dish was served with an explanation of the dish provided by the owners. Robin’s South African Breakfast, a brunch item consisting of a mixture of onions, tomatoes, and bacon with eggs had an interesting taste to it, but did not really speak to my taste buds. The Crustless Quiche was palatable, but a little salty. The Original Spinach and Provolone was superb and after devouring it, I found myself wanting more. I normally dislike spinach, but this mixture really went well together. 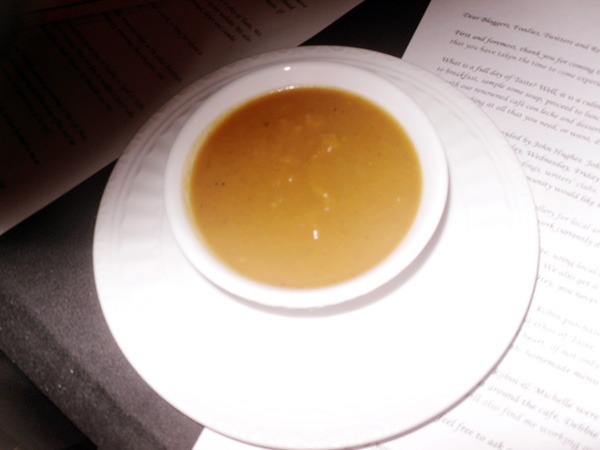 The pumpkin curry soup had some tanginess to it. The curry flavoring brought a different twist than what I was expecting. The pumpkin taste was there, but a little weak for my liking, perhaps overpowered by the curry taste. I think the soup would be better if it were a little sweeter as well. The taste was still pretty good though and I did enjoy eating it. I am a big fan of anything pumpkin related from pumpkin lattes to pumpkin pie and pumpkins are one of the main reasons I love the fall season. 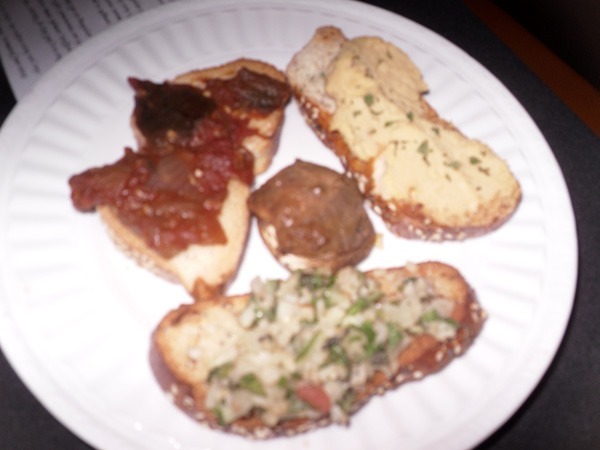 The 3 spreads and a stuffed mushroom. The hummus, tabouli, and eggplant spread tapas were all enjoyable. My favorite was the eggplant spread. I normally detest eggplants, but the spread had a sweet taste that hit my taste buds just right. The tabouli spread was my second favorite spread, covered in onions (my favorite vegetable) and having a lemony taste to it…if you do not like onions then it really is not for you. My least favorite spread, the hummus spread, was still enjoyable but did not really have anything that screamed out to me about it. One of the reasons the hummus spread was not as enjoyable to me was because I prefer moist spreads over dry spreads. The stuffed mushroom was my least favorite thing I tried. I normally like blue cheese, but the dry tart taste in the mushrooms did not appeal to me at all. The blue cheese really overpowered any mushroom taste there. 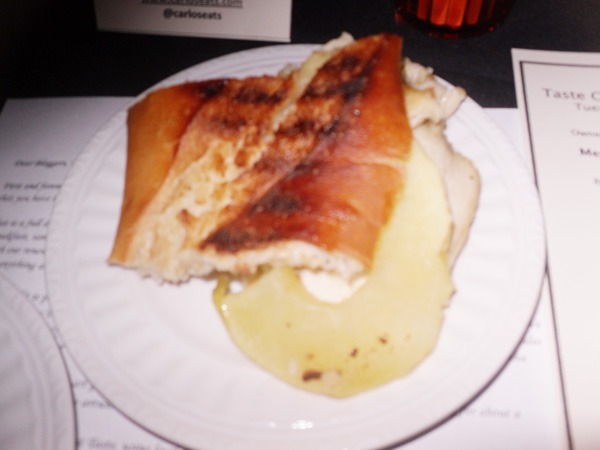 The Le Cheekon sandwich, my favorite tasting from the evening, included chicken, pineapple, brie, and honey butter, all pressed together. The pineapple gave the sandwich a sweet Hawaiian taste to it and I found the chicken to be juicy and flavorful, really satisfying to my taste buds. 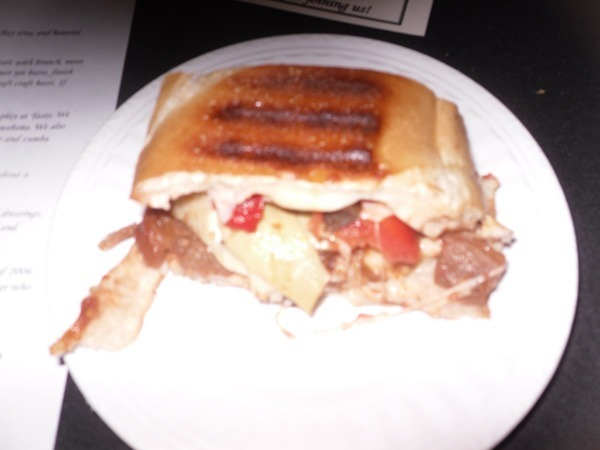 The vegetarian option, the Medi Veggie sandwich, was enjoyable, but did not spark my interest in the same way the Le Cheekon sandwich did. 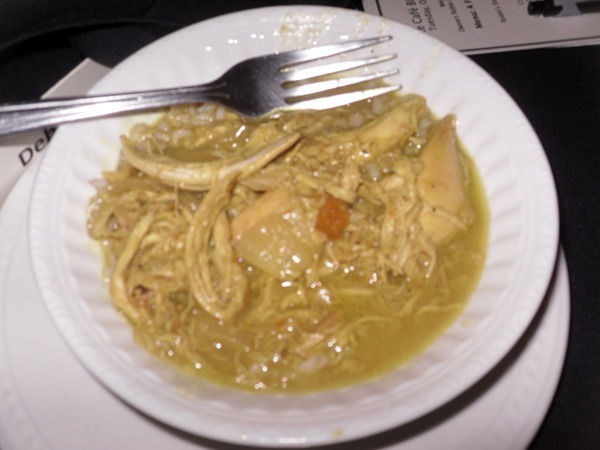 The main dinner entree was curry chicken served over brown rice. Almost tasting a little Hispanic with a touch of curry spice, this entree was enjoyable down to the last piece of rice. They gave us a few condiments to experiment in taste with it, but I found the entree to be flavorful enough on its own. Although the curry chicken does taste good, I would still order a side with it if I was having it as my only choice, because it lacks a few central tastes to a complete meal, in my opinion. Despite being completely stuffed, dessert came and we were presented with two desserts: Dark Chocolate Mascarpone Pie and Carrot Cupcakes. The chocolate in the Marscarpone Pie cupcake was sweet, without going over the limit and becoming too sweet. The texture underneath was smooth and really enjoyable, a balanced chocolate choice. 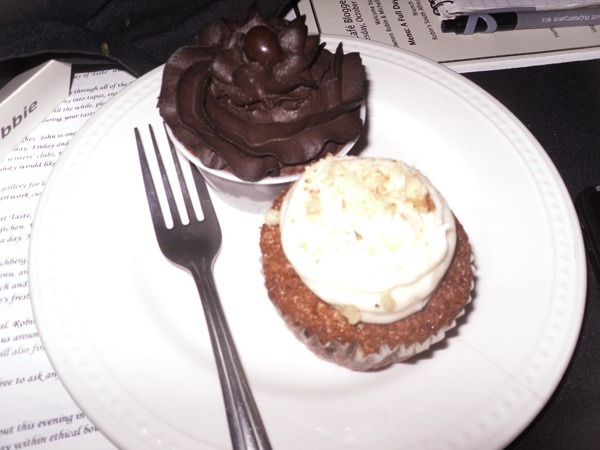 The carrot cupcake was pleasant, but a little dry. The cafe con leche they served with the cupcakes was a little bitter, and I would probably have some milk instead with these desserts. Overall, there was a number of different things served to us and these dishes could appeal to people with many different taste buds. Attention was placed on flavor and I would say many of the choices were flavors different from your typical expectations when having these options, a pleasant surprise indeed. Taste Cafe’s idea to have a bloggers dinner says something about them, they want people to know about the food they have, even if critics or reviewers have opinions that may not be what they want and that is a bold thing to do. Their diverse menu, interesting flavors, and hospitality will bring me back there again in the future.